L & I made this recipe a few days ago… and swooned. It’s seriously that good. Again, adapted from the Farmers’ Market Cookbook: Best of Summer (Vegetarian Times Special), but we had some fun with it. So, rations are slightly off – ahem – more eggplant filling than eggplant shells to fill…but who actually considers that a bad thing? We certainly didn’t as we stuffed our faces in anticipation for the real thing. Without a doubt, the best dish we’ve EVER made together. This is what keeps our friendship alive. Keep in mind, original recipe serves 6. We are, but of two hungry bellies. 1. Halve eggplants lengthwise, and scoop out flesh and seeds, leaving 1/2-inch-thick edges on eggplants’ shells. Cut scooped-out flesh into 1/2-inch pieces, and set in colander. Sprinkle eggplant pieces and inside of eggplant shells with salt. Let stand 25 to 30 minutes, or until beaded with moisture. (note: apparently it reduces potential bitterness, but may skip next time. time = money. worth it, but a bloody long time.) Rinse eggplant shells and pieces in cold water, and pat dry. 3. Meanwhile, heat 1 Tbs. olive oil in large skillet over medium-high heat. Sauté onions 3 minutes, or until translucent. Add eggplant pieces, tomatoes, walnuts, cinnamon, oregano, and 1/4 cup water. Season with salt and pepper, if desired (yes, do). Cook 8 minutes, or until vegetables are softened and browned, stirring occasionally. 5. Divide filling among eggplant shells. 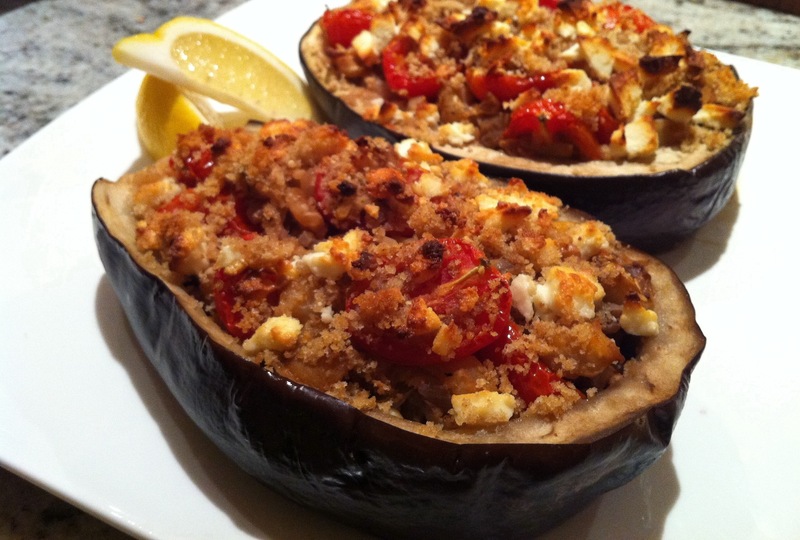 Sprinkle each stuffed eggplant with breadcrumb mixture, and top with feta cheese (or in our case, 1 with feta, 1 with goat cheese). Bake 35 minutes, or until heated through and browned on top. Serve with lemon wedges, if using. 6. While waiting, enjoy extra eggplant filling with a glass of vino. J&S, if you guys try this wknd – can’t wait to hear how it turns out!